1 1/2 miles from Pt. Morvia lighthouse off Bar Point. Sunk in collision with schooner HUNTER SAVIDGE in 21' water. Stripped & abandoned. Wreckage removed May 1893. 1862, Apr 15 Registered Port Burwell, ONT. 1865,Oct 20 Charles McDermand; Port Burwell,ONT. 1871,Mar 30 Owned William Walker; St. Catharines, ONT. 1872,Jan 24 Owned M. Chisamore & T.J. Best; St. Catharines, ONT. 1874 Sold to Capt. 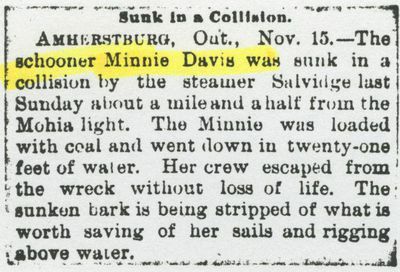 Davis, Alexandria Bay, NY; repaired & renamed MINNIE DAVIS (US90635). 1881,Jul 20 Owned H. Hill; St.Clair, MI. 1882 Rebuilt 94' x 21' x 10'; 173/164.35 tons. 1888,Apr 28 Owned Adelaide M. Jex; Port Huron. 1890,May 2 Thomas Dunford; Port Huron, MI. 1892, Nov 13 Sunk; cargo of coal.